I can’t help but wonder if the Mets pitching coaches from rookie ball up are not partially to blame for the numerous arm injuries Mets pitchers have suffered, and continue to suffer. At times like this I am inclined to break down the machine and find where the fault lies. 3 pitchers out with elbow injuries in 3 weeks has got to be a red flag even for the Mets. Plus Familia. Francisco. Atchison. Byrdak. Parnell. Edgin. Sorry if I missed anyone. Nobody is responsible, he didn’t over-pitch. Harvey wants to be a workhorse and that’s fine. I’m mostly worried about if he will be any good after surgery. What a shame. This is a devastating loss for the Mets and, quite frankly, all of baseball. But I think this is a wake-up call for all of baseball as well. Baseball needs to start doing something about these injuries instead of just saying “It happens” and “it’s part of the game.” The Tommy John injury does not just “happen.” It is the result of something and it most definitely can be prevented through sound mechanics, proper sequencing and good functional strength in order to promote an efficient transfer of energy throughout a pitcher’s delivery. It’s amazing that Major League Baseball and its fans believe that there is no science involved in any of this. That’s simply not true! There is a reason that Greg Maddux and Nolan Ryan never landed on the disabled list and it is not because the “Grim reaper” that people believe to be injury simply chose not to come after them. These guys had sound mechanics and sequencing, and good functional strength. Major League Baseball needs to stop living in the dark ages and start paying attention to the science that is baseball and injury. The science is out there! Coaches like Tom House and Steve Johnson have released it, but these people are simply not willing to use it. Part of the problem with this industry is its obsession with power. They look at a guy like Matt Harvey who throws 99 and say that “he doesn’t need help because he throws hard.” This is not always the case as we have seen here today. 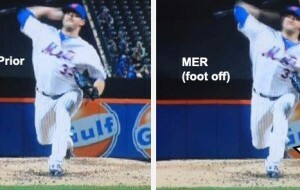 Matt Harvey was weak in one of the three areas listed above, and MLB and the Mets simply did not address it because of his success and his power arm. This is just ridiculous. Major League Baseball’s biggest enemy is itself. They need to get their heads out of their butts and start using the information that’s staring them right in the face. Nick, I’m with you 90% — just be careful about mentioning Tom House, who knows just enough to be dangerous. Nolan Ryan did not go on the DL for something other than back spasms in his career until meeting House. Coincidence? Maybe — after all, the guy was in his mid-40s. But it was also the first time Ryan ever did ridiculously stupid, unscientific drills such as tossing a football as part of House’s mad experiments. Bobby Witt, Jose Guzman, Edwin Correa, and other promising Texas youngsters blew out their arms on House’s watch. But the most damning indictment of House is his insistence — as swallowed whole and published in a book by “Injury Expert” Will Carroll — that Mark Prior had “perfect mechanics.” Nothing could have been further from the truth, according to qualitative biomechanical principles. But, you are on the right track: the science is available, but it’s up to MLB teams to either use it, or continue to believe the world is flat. Thanks for the reply! I do have one thing to say though. I think that Tom House deserves more credit than you’re giving him. Tom House was willing to change when no one else was. Other coaches saw that their pitchers were getting injured but refused to veer from conventional wisdom. Also you have to look at the many pitchers whose careers have changed for the better with House’s help. Nolan Ryan is one of them. Also we have to remember Steve Delabar, who has screws and plates in his elbow, but thanks to a program developed by Tom House and Steve Johnson (personal adaptive joint strength threshold training is the name of the program) he was able to resurrect his career. He even made the all star team earlier this year. House has even been beneficial to my career. My arm is healthier than it’s ever been and I’m throwing harder than I ever had. I guess what I’m trying to say is that in a world of stupid coaches who do the same thing over and over again and expect a different result, Tom House wasn’t afraid to think differently.